1. Turn the ignition key on. 2. Lightly apply and release the foot brake several times. 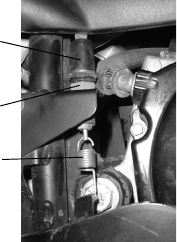 nut clockwise to increase tension on the spring. comes on when there is no pressure on the brake pedal. 4. Recheck and readjust as needed until the brake light operates properly.